Over the weekend I, as well as many others, have been binge watching the latest adventures of a masked vigilante who dons a darkly colored suit of armor while sneaking out late at night to brutally beat evil doers to a pulp mostly with his bare hands (or his gadgets). He has his work cut out for him keeping the streets of the noirish, crime-ridden city in which he lives free from oppression from gangs and corrupt cops. But he’s been trained exceptionally well in the martial arts from a man whose ninja assassin organization often deals in morally ambiguous schemes, which often puts the two at odds. Thankfully this vigilante has a strong moral code with which to live by. He doesn’t kill his enemies, he apprehends them and leaves them for the police. He often works side by side with the police, particularly one officer who has risen through the ranks, even if they have a somewhat uneasy bond. And for a comic book superhero the series often deals in more mature themes as he struggles to balance a life between his secret identity and his duty as a masked vigilante. But enough about Batman, let’s talk Daredevil. Ok, I couldn't resist. But unlike Bruce Wayne, Matt Murdock lives a far more humble life. He doesn’t have a rich upbringing or access to secret, experimental, military grade equipment. Rather than inheriting his father’s very successful business and wearing fancy suits while attending high society gatherings, Murdock lives in a rundown apartment in a bad part of town and works with his friend to keep their fledgling law office afloat. Though he is blind (like a bat) due to an incident during his childhood involving a radioactive substance that stole his eyesight, he did develop minor superhuman abilities that, much like a bat, grant him a sort of radar (or is it sonar?) that allows him, using his now heightened senses, to hear and feel things well enough that you might not know he can’t see. His ability to detect the heartbeat of the person he’s talking to ends up being a useful skill both as a vigilante and a lawyer seeking the truth (which on occasion allows for some classic noir-like detective work). Daredevil was made popular in the hands of writer Frank Miller, who was a long time Batman fan who used his love of Batman as inspiration for his Daredevil stories before eventually writing iconic Batman comics The Dark Knight Returns, and Batman: Year One (both of which heavily influenced Nolan’s Batman films). So if Marvel’s Netflix series resembles Christopher Nolan’s dark, noirish take on Batman, we have Frank Miller to thank. Clearly audiences have responded. Both series have been critically and commercially successful. So even if season two doesn’t do much to differentiate itself, it does continue in what has become a tried and true formula, all while managing an artful and very human take on the famed comic book franchise. Season two picks up where season one left off, with primary villain Wilson Fisk (aka Kingpin, played by Vincent D'Onofrio) locked away, and Matt Murdock (aka Daredevil, played by Charlie Cox) and Franklin “Foggy” Nelson (Elden Henson) and their assistant Karen Page (Deborah Ann Woll) enjoying their law firm’s recent success, and marvelling at this masked vigilante who seems to have quickly made a marked difference in their neighborhood. 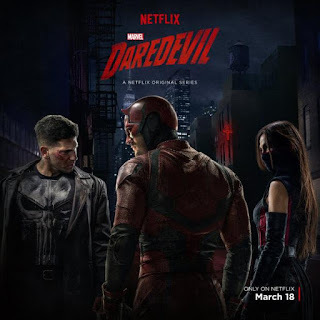 Yet Daredevil is quickly thrown back into action as Frank Castle (Jon Bernthal), better known as “The Punisher,” begins a widespread murder spree, and Matt Murdock’s ex-girlfriend Elektra (Elodie Yung) comes back into his life looking for both love and assistance in taking down a violent ninja assassin organization called “The Hand.” Elektra’s presence disrupts what had been a budding romance between Murdock and a certain other person, yet rather than make it as simple as that, Goddard wisely gave the break a more concrete reason for being. In a time in which Daredevil needed to steel his mind and dedicate himself to the morally upright method of fighting crime, he pushes away both potential love interests due to their increasingly morally ambiguous opinions on fighting crime. As we know, The Punisher is another one of Marvel’s heroes, even if he’s an anti-hero. So we suspect from the beginning that neither will he die, nor will he remain at odds with Daredevil for long. Despite knowing that, watching things play out remains engaging. He is the anti-Daredevil. He’s a war veteran who witnessed his family's murder, and now spends his days equipping himself with as many guns as he can carry while waging brutal war on the criminals involved in his family's death. Where Daredevil would subdue and turn in a criminal, The Punisher would torture them for information before putting a bullet in their head. They are, for all intents and purposes, complete moral opposites. As such it’s particularly interesting watching these two spar and play off each other. Jon Bernthal gives a show stealing performance, particularly in one scene that plays out in a long take in which he bares his soul to Daredevil. Watching them tentatively move from enemies to uneasy partners is one of the many driving forces behind this season. The moral quandary here is, should we kill criminals to keep the rest of us safe. Is there no chance for reform for criminals? Should we maintain our moral code of ethics even in dire situations? Or is the law and due process a failure to keep us safe? This is clearly the central battle of season two. The Punisher and Daredevil are the two opposing positions personified. Elektra, on the other hand, is someone caught in the middle. Her ties to Matt Murdock may save her. He wants to convert her to his way of thinking because he believes she can change, even if her upbringing puts her more inline with The Punisher’s methods. Yet her moral battle is exactly what Daredevil believes in. Whether or not she can be made good is his case for justice, his proof that The Punisher kills before ever granting the possibility of a life changed for the better. 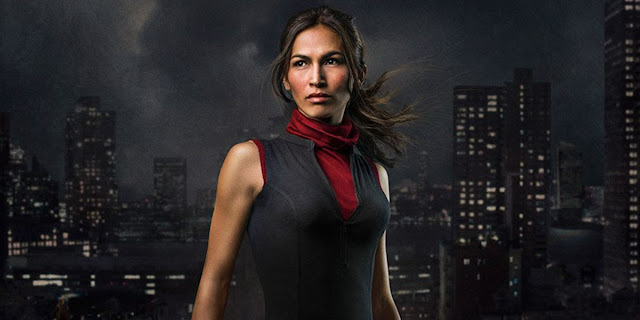 Elodie Yung is great for her part. She pulls off the martial arts while giving a layered performance. Murdock’s time spent meeting up with Elektra to chase up details on the mysterious ninja assassin organization “The Hand,” often steals him away from important legal matters which leaves Foggy Nelson and Karen Page to pick up his slack. It all leads the trio to the breaking point. While the show is about Daredevil and spends much of its time with him, Foggy and Karen both get a healthy amount of screen time. Karen finds herself intrigued by Frank Castle’s story, and drawn to helping him recover information about his family and those responsible. Yet all her time spent with him causes her to question her own moral code of ethics. And of course, there are a handful of surprise guests that show up here and there to spice up the season, either in brief cameos or to play a more important role over the course of a few episodes. Keeping all these character’s individual story arcs moving and tying it all together causes this season to become fairly convoluted at times. While it mostly works, it can be clunky, especially when it’s moving back and forth between Daredevil and Elektra’s violent war on “The Hand” and Foggy and Karen’s courtroom proceedings. Nevertheless, as much as this season juggles, it remains engaging throughout. Though at times it did make me wish for a simpler more concentrated journey, much like the season long Fisk vs Daredevil arc from season one. Screenwriter Drew Goddard originally pitched this take on Daredevil as an R-rated movie much smaller than what Marvel had been doing with their other heroes. However typically when Marvel does a superhero film, they do it big, give it a huge budget, and end with the near destruction of an entire city. More importantly they do it with a PG-13 rating so the whole family can head out to the theater together. None of that sounded like what Goddard had in mind, nor does it sound like something that would work for this particular character (at least after seeing this particular take). Daredevil is more concerned with his own neck of the woods. He isn’t flying around the world or fending off an alien invasion. Goddard also wanted the fight sequences to be inspired by the brutal action of “The Raid” movies. While it’s a different fighting style, the show mostly succeeds in this endeavor. There’s a stairwell fight sequence and another in a jail cell that are highlights of the season. They’re so nail bitingly intense they feel like they could’ve come straight from one of The Raid’s own deleted scenes. All of this begs the question of what Marvel’s long game is here? With two seasons of Daredevil, one season of Jessica Jones, and one season of Luke Cage (set for a Netflix release on September 30), and a show devoted to Iron Fist in the works, it’s likely there will be more crossover between these three series, and likely more Marvel characters joining the fray within upcoming seasons. The plan for these Netflix series is an eventual combined series called “The Defenders.” But just how these characters will factor into the larger goings on in the MCU is yet to be seen. With The Avengers out saving the world, The Guardians of the Galaxy out keeping the universe safe, they are referring to their small screen efforts as “street level.” Between Agents of SHIELD and these Netflix shows they have “street level” covered. Whether or not the cinematic universe and these “street level” shows will ever see crossover is anyone’s guess. One way or another, if what Marvel has done with their cinematic universe feels too big, their small screen efforts may be more up your alley. As a fan of Batman, Daredevil remains among my favorite things Marvel has committed to the screen.